Lancing Parish Council has been criticised by MP Tim Loughton after the beach was ‘left in a mess’ following a party held there at the weekend. But the council claims the company that organised the private BBQ Bikini Beach Party on Saturday ‘misrepresented’ itself on an application to use the beach, saying the event was a ‘fundraiser for a children’s charity’. Colin Hunt, parish council clerk, said: “We had the same last year and we said we would look very seriously at their application, but this year they said it was for charity and it wasn’t until the event we realised. It wasn’t until things transpired that we felt it had been misrepresented. “We had to clean up the next day as the beach was left in a mess. We need to be more vigilant, but we took the booking in good faith. The event started at 10am and ran until 7pm on Saturday, keeping part of the beach and Beach Green private for most of the day. 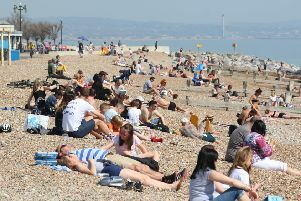 A spokesman for Adur District Council said: “As a duty of care, Adur and Worthing councils’ services assisted with the clear up of the beach after we were notified about the mess. A spokesman for RMD Entertainment, which organised the event, insisted it had notified the council and that all proceeds were going to a ‘project for homeless children’.